Kashmir’s centrality to Indian intellectual life was not a short-lived thing. It was one of the great centers of Buddhist learning for much of the first half of first millennium. In later centuries, it was central to the development of Shaivism and Vedanta. Kashmir is in the news, and it has been in the news for 70 years now. Yet its mindshare among Indians is still somewhat low and its centrality to Indian civilization and culture is woefully under-appreciated. The Kashmir valley is, as we all know, one of the three regions of J&K – with Jammu and Ladakh divisions being the other two. In terms of area, Kashmir valley accounts for only 16% of the state’s area. An examination of the population densities of the three regions suggests that the Kashmir valley is more than twice as dense as Jammu. In fact, Kashmir valley, far from being an isolated frontier, is among the more densely populated regions of India. It’s density of 433 per sq. km is significantly higher than the Indian average of 382. Here are some of the provinces with much lower pop densities than Kashmir. Excepting the Indo-Gangetic plain, and the Tamil / Chera country, there is hardly a province in India with a population density greater than Kashmir’s. No wonder that the valley was always very central to Indian civilization for the past two millennia. Hardly peripheral. Hardly a hinterland. Why is the Kashmir valley so much denser than the Jammu division? Sure. Kashmir has the Jhelum River. But Jammu has the Chenab. One argument is that Jammu is not entirely a plain and its northern reaches comprise of the Pir Panjal ranges, which makes it less habitable. However even the low lying areas of Jammu are much less dense than the Kashmir valley. For instance, Samba district in Jammu has a density of 320 per sq.km, while Kathua has 200 per sq.km. One doesn’t have a good answer to this. But it looks like even in antiquity, the Kashmir vale enjoyed a greater pre-eminence than Jammu. All the great Hindu kingdoms of Kashmir were headquartered in the valley, and not in the Jammu plains. The great capitals of the Karkota Empire were in Shrinagara and Parihasapura, in the Kashmir valley. The latter was built by Lalitaditya Muktipida – arguably the greatest of all Kashmiri monarchs. Srinagar, the capital of Jammu & Kashmir, is not just the northernmost city in India, but is a very densely populated city given its size with 4000+ people per sq. km. It also has a claim to rank among the oldest continuously inhabited towns in India. A city that is usually associated with the town of Pravarapura discussed in Kalhana’s Rājataraṃgiṇī in the 12th century. As per that text, the city was founded by King Pravarasena who is usually dated to 6th century CE. Having discussed some salient features of Kashmir’s geography, let’s examine Kashmir’s intellectual legacy. What makes Kashmir central to the evolution of Indian thought and intellectual history? One of the central figures in Chinese Buddhism, the Kuchan monk Kumarajiva, was of Kashmiri ancestry. His father Kumarayana was a Kashmiri who crossed the Pamir mountains and settled in modern Xinjiang. The son Kumarajiva was a prolific translator of several Sanskrit Buddhist works to Chinese. Including the Lotus Sutra. A very central figure in Chinese Buddhist history. Kashmir is also that rare province that stands out in Puranic lore, in having an entire Purana dedicated to it – the Nilamata Purana. The Nilamata Purana is usually dated to 6th/7th century CE, and was one of the primary sources used by Kalhana for his work on Kashmir 500 years later. The province’s deep connection with Hinduism, can be guessed from the very etymology of its name. The word “Kashmir” is very much derived from Sanskrit. While some view it as “Ka-shimeera” (desiccated land), others view it as Kashyapa-Mir – the land made habitable by the great sage Kashyapa. Greek sources including Ptolemy refer to the land as “Kasperia” suggestive of the Kashyapa connection with Kashmir – a land that was formerly a lake, but drained by Kashyapa Maharishi, under whom the first Brahmin settlements in the region happened. One of Kashmir’s greatest intellectual products was the redoubtable Abhinavagupta (of 10th century) – a native of the valley, who is remembered to this day as one of India’s finest philosophers and polymaths. Today one remembers Abhinavagupta as a critical figure of Kashmir Shaivism and Tantra. But he was a lot more than that. This Kashmiri was not just a man of religion, but a theorist of Indian art and aesthetics. He wrote commentaries on the works of both Bharatamuni (Natyasastra) and Anandavardhana. The idea of “rasa” is central to Indian art today. Though mentioned in Natyasastra, its elaboration happened mainly in the hands of Abhinavagupta in his Bhashya “Abhinavabharati”. Kashmir’s intellectual heft is further indicated by the legends in the Dravida country in the hagiographies of Sri Ramanuja, the Sri-Vaishnava philosopher. When Ramanuja wished to write his commentary on the Brahma Sutras (Sri Bhashya), he wished to refer a Vrtti written by Bodhayana on the Sutras. 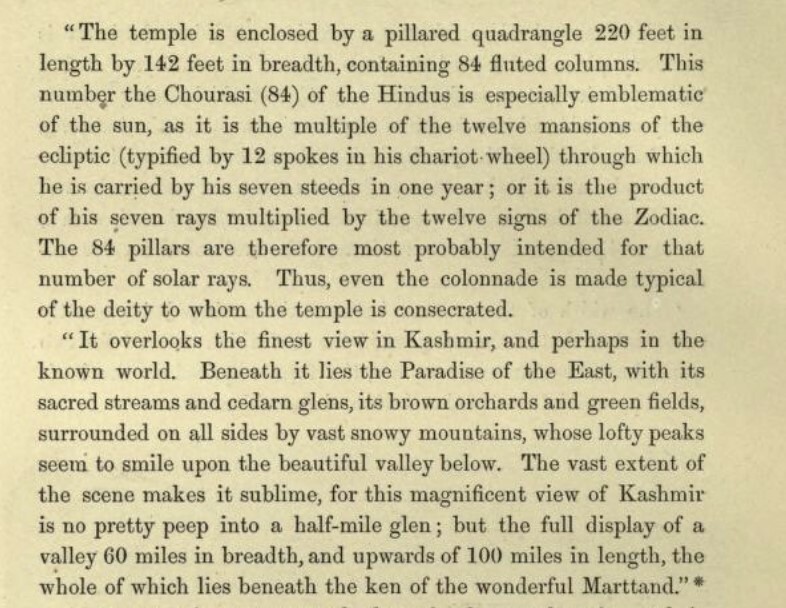 A manuscript of the Vrtti was available only in Kashmir which prompted Ramanuja to journey to Kashmir from Tamil country to reference it. Kashmir is also exceptional among Indian regions in being one of the few parts of India with a very vibrant historical tradition. Several histories of this region have been authored, be it Nilamata Purana of the first millennium, Kalhana’s Rājataraṃgiṇī or Jonaraja’s Dwitiya Rājataraṃgiṇī in medieval times. This historical tradition is unique to Kashmir, and rather uncommon in other parts of India, where historical records are often patchier. Kashmir’s geopolitical heft, though arguably exaggerated by scholars like Kalhana, is no less worthy of our attention than its intellectual contributions. 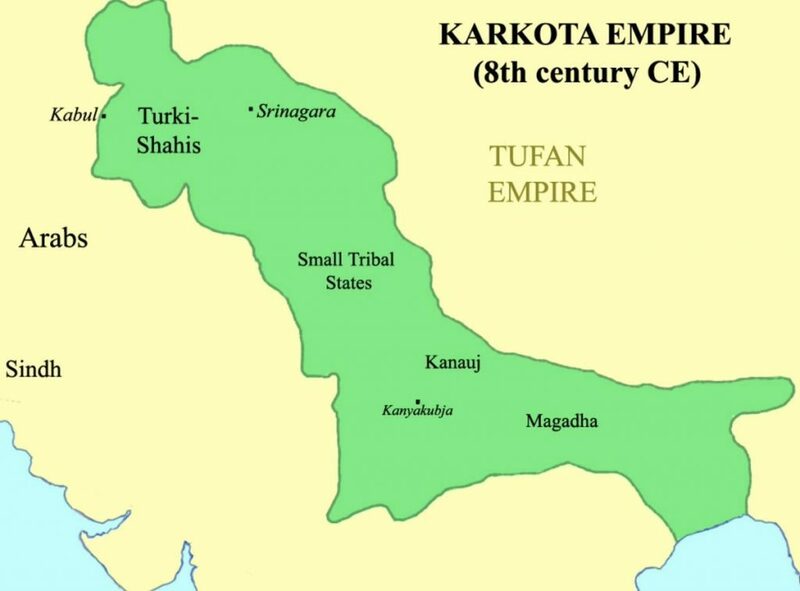 The Karkota Empire during the reign of Lalitaditya Muktapida, was headquartered in the valley but extended its sway across much of North India at least for a brief period. One of the grandest temples in India – The Martanda temple – was built in the Vale of Kashmir near modern Anantnag by Lalitaditya. The temple lasted 5+ centuries before being demolished by the Shah Mir sultan Sikandar in the 14th century. 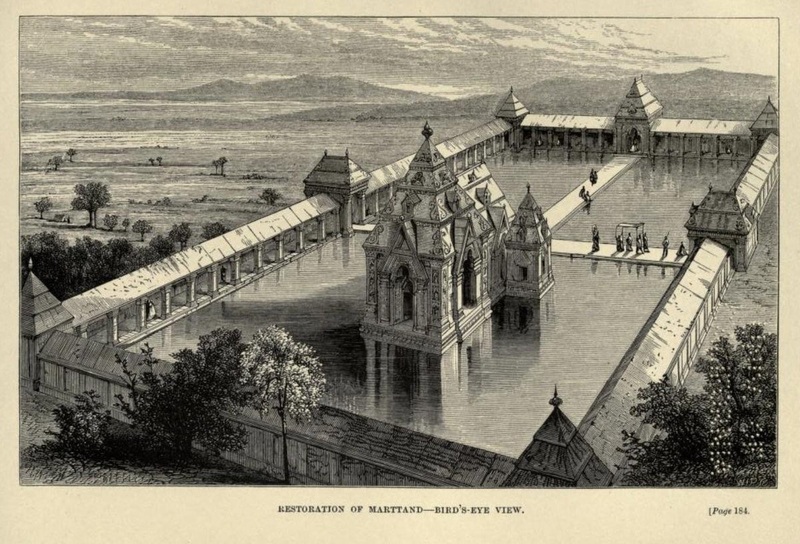 Above is an artistic illustration of the Martanda temple in its full glory, as depicted by a Victorian artist in the 19th century (Source: Letters from India and Kashmir, J. Duguid, 1870). So clearly Kashmir’s influence was not just on the intellectual plane, but it was very much a Hindu center, and a region of widespread practice of popular Hindu religion. Now let us move on to medieval times post 12th century. There is a perception in some quarters that Kashmir was among the first regions of Greater India to Islamize. That’s not quite true. In fact Mahmud of Ghazni did not succeed in raiding Kashmir, even though he raided much of North India. The Lohara kingdom held on. Kashmir remained staunchly Hindu, right up to the 14th century. Even Mohammad Ghori did not annex Kashmir at any point during his conquests. It was only in the 14th century after the fall of the Loharas that Kashmir fell into the hands of the Shah Mir dynasts who established Islam in the region. Eventually Kashmir fell under the Mughals, in 16th century during Akbar’s reign. But it was also one of the early provinces to move away from the Mughals. In the mid-18th century, power shifted to the Durrani Afghans. In early 19th century, the region came under Sikh rule – governed by the great Ranjit Singh of Lahore. In 1846, post the Anglo Sikh wars, the region was gifted to the Hindu Dogras, under Gulab Singh, whose dynasty ruled till 1947 when the province acceded to India. So unlike many other parts of India, Kashmir has not been under Muslim rule since early 19th century. A region that was under Sikh rule from 1820-46 and later for the most part Hindu rule from 1846 to 1947. However the culture had been Islamized a few centuries before all of this. The Sikh and Hindu rulers did not succeed in (or probably did not even attempt) cultural engineering. The demography remained mostly Muslim though the Jammu plain remained predominantly Hindu and Dogra. Recent history of Kashmir is well known to most people. The key aspect of Kashmir causing the conflict has been the demographic balance, to which we now turn our attention. It is clear that post 1980s, given the flight of the Kashmiri Pandits, the Hindu population in the valley has declined to barely half the levels that existed in 1961. While the 3.4% Hindu population may seem significant, what’s interesting and also alarming is the nature of the Hindu population in the region. We notice that out of the 168K Hindus in the valley, over 150K are males, and most of them are working males. The age distribution of the Hindu population in the valley is also striking. 88% of the Hindus in the Kashmir valley are between 20 to 49 years. So the valley, in effect, has no Hindu families. Our examination of Kashmir’s history suggests that the region does have a lot to offer to Indian civilization. However for Kashmir to continue to be a part of the India story, what’s needed is not just security measures, but also a cultural renaissance. A spiritual regeneration that reminds the Kashmiris of the region’s centrality to Indian life and Indian thought. Such a regeneration need not be anti-Muslim. But it definitely would entail a more religiously diverse valley than what we see today. For Kashmir to remain Indian, it has to cease being a monoculture. Something that it never quite was for most of its history right up to 14th century. “Hey…why do we harp on ancient history and cultural connections..
“Let’s face up to ground realities”..
What this view ignores is that what’s at stake is not just Kashmir valley, but also Jammu and Ladakh. While Ladakh and Jammu are not quite entirely Muslim, there are large parts of both divisions that are significantly Muslim. Let’s take a closer look at Jammu and Ladakh. Now let’s take a look at Ladakh – the least populous of the three regions. Ladakh on the whole may be 53% Buddhist / Hindu. But within Ladakh, Kargil is 77% Muslim (mostly Shia). In contrast Leh is only 14% Muslim. The reason one brings up the demographic diversity of Jammu and Ladakh is to emphasize that separatism on the basis of religion is dangerous in its implications, not just for Kashmir valley but also Jammu and Ladakh. Once you start ceding ground to “self-determination” movements on the dicey basis of religion, there is no end to it. “Kashmiriyat” is by no means antagonistic to Indian-ness. The separatist movements derive their sustenance from a religious impulse, as opposed to any kind of pride in being a Kashmiri. The invocation of Kashmir’s checkered past has to be at the base of any Indian argument on the region. It can never come down to numbers, and whether a community is 60% or 48% in a. given district. Such a mindset would not spare not just Kashmir but will eat away at many other parts of this very diverse cosmopolitan state. Shrikanth Krishnamachary is a data scientist in financial services based out of New York City, whose interests include economics, political philosophy, Hinduism, American history, and cricket.